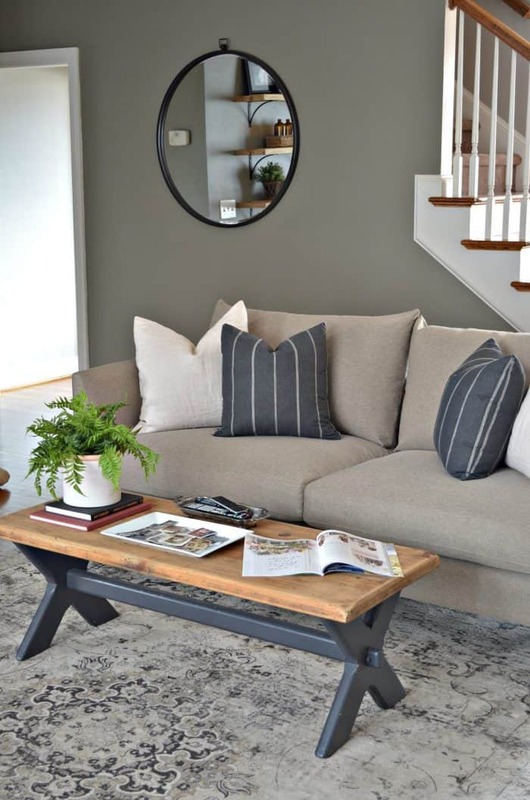 This living room makeover with Bassett Furniture will showcase how to mix modern and classic pieces for an updated look. Choosing modern and traditional, vintage and new, can create a beautiful lived in luxe space. This post is in partnership with Bassett Furniture. As always, we only team up with companies we love and feel confident in sharing with you. 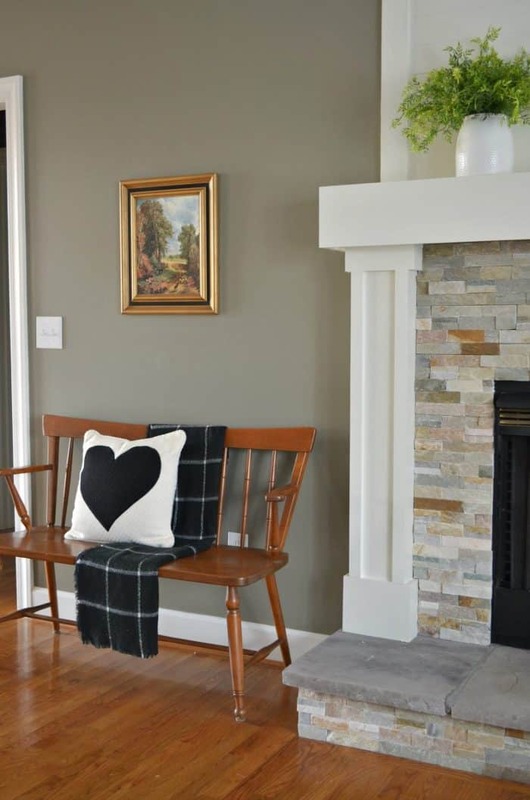 Our living room makeover has been in the making since before the holidays. Bassett reached out months ago to partner with Ray and I on new furniture. We were thrilled to find out we would have the option to choose from classic pieces as well as from the new lines launching. Bassett Furniture’s focus on quality comes without compromise. For more than 100 years they have been perfecting the art of crafting furniture full of American ingenuity. Bassett is dedicated to making comfortable, long lasting furniture. You can count us in! Let’s face it, a complete room makeover is not easy, no matter what you see on a 30 minute TV show or a read online. There are many moving parts to a room makeover. In my case, new furniture. That meant choosing fabrics, choosing pieces to mix with other furniture I already owned, then furniture size and placement. There is also paint, curtains, art, accessories, and more. The Ariana sofa is a brand new addition to Bassett’s Modern collection, which was introduced a year ago. We wanted our living room to feel modern and luxe while being completely livable. I tend toward neutral colors of black, white, gray, and tan. Mixing texture and a few fun pieces keep the look interesting. If you are looking to update a space my advice is to choose a modern piece, as we did with the Ariana sofa and mix it with some classic ones. That’s where the Pippa Chair and Pippa Ottoman come in. 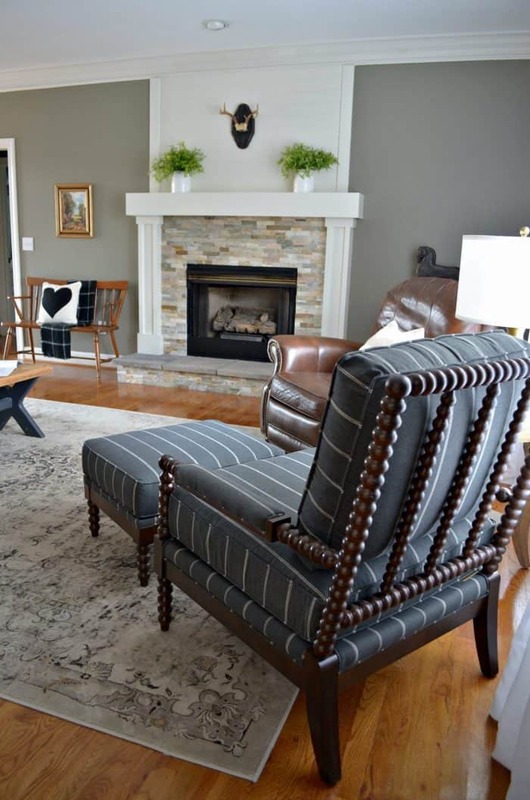 The classic style of the chair and ottoman got a bold black printed stripe fabric. All of the furniture pieces from Bassett are custom so I had them make the 2 sofa pillows in the printed stripe chair fabric instead of the latte sofa fabric. The Connery lamp is Ray’s favorite lamp we have ever had. He loves the polished antique brass accented finish. Me, I love mirrors. The round one (Manning wall mirror) is the perfect spot for everyone to check themselves as they are headed out. Plus, the circle shape and dark metal work perfectly. The big mirror (Kentridge Leaner mirror) in the foyer is absolutely amazing. Besides being huge, the modern shape updates our home so much. 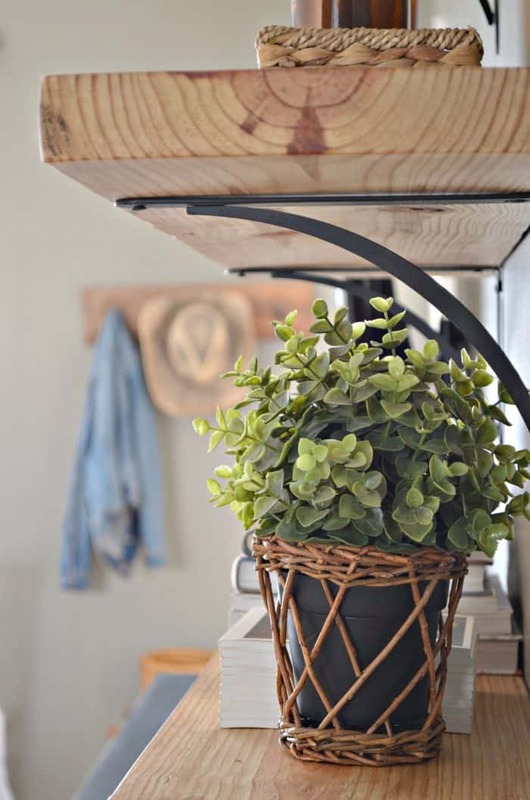 Since choosing new furniture is the first step of any room makeover I wanted to give you my best tips to help you get it right. I always like to teach you guys something. Use this information before you head to Bassett to meet up with a designer. Style of furniture will include the over all look and shape. When choosing a piece as big as a couch, I would recommend you keep it neutral. 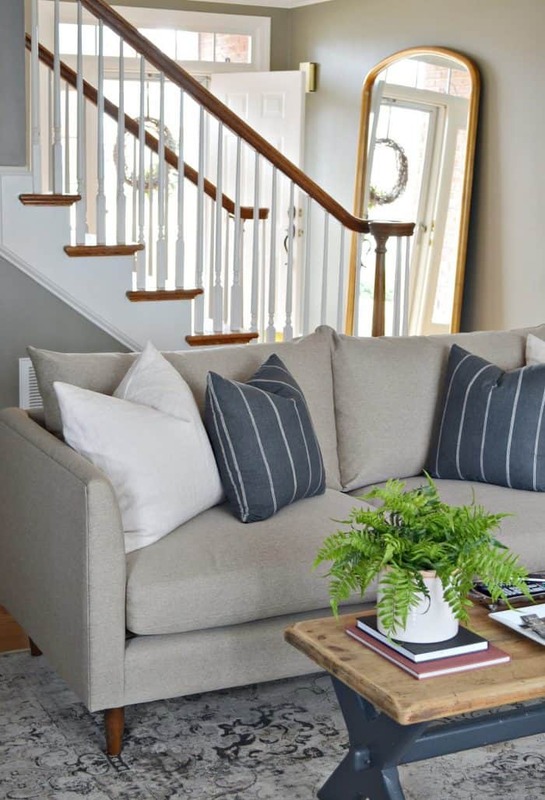 Then add more detailed fabric on pillows and smaller furniture. Leather can be neutral too. Bassett has so many gorgeous leathers and I was tempted to go that route again. We had our leather couch for almost 20 years. I was ready for a change so I went with a neutral tan (called latte) for my Ariana sofa fabric. I made sure the fabric would hold up well to having a dog so I chose the performance weave. Keep in mind any pieces of furniture you already own that will stay. While I highly believe in mixing and matching, I do think there needs to be some overall consistency for flow. Ray’s favorite leather recliner, a side table, TV cabinet, and the coffee table were all staying. So I went with more clean line, classic sofa. 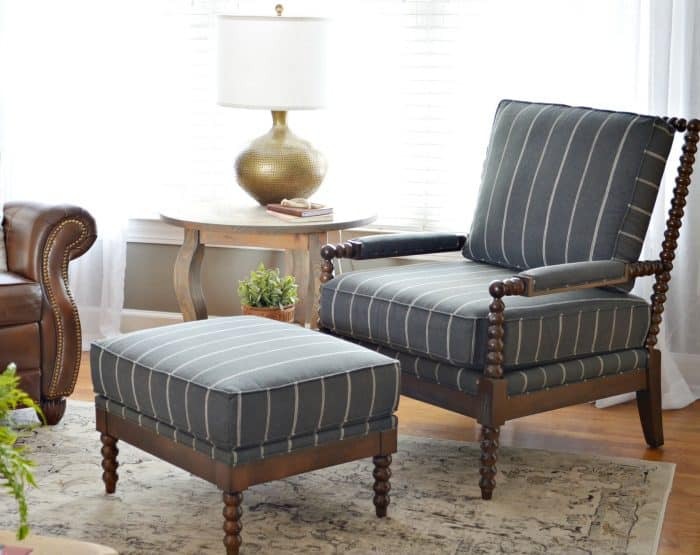 The Pippa chair and ottoman stick with a stream line look with the stripe fabric but the wood has a fun yet classic detail. Size does matter. The entire makeover can go wrong with furniture that is too small or too large for a room. Keep it proportional to the size of the room. Grab the measurements of the pieces you are considering. Next take painters tape to mark off the floor where your new furniture will go. This is an especially handy tip if you are considering a sectional. Now you are able to see a visible mock up of the new furniture size in your room. Fabric should be comfortable and durable. Well, at least those are my prerequisites. Especially if you are pet owners like us. I took a trip to my local Bassett furniture store in order to see and feel the fabrics in person. My sister went with me to offer a second opinion. Bassett has in house interior designers free to help you as well. Since my sister knows my home I wanted her thoughts too. If you have been following along on Instagram you know there have been lots of decisions for choosing a new paint color for my living room. I made sure to take my own advice for choosing the right color. 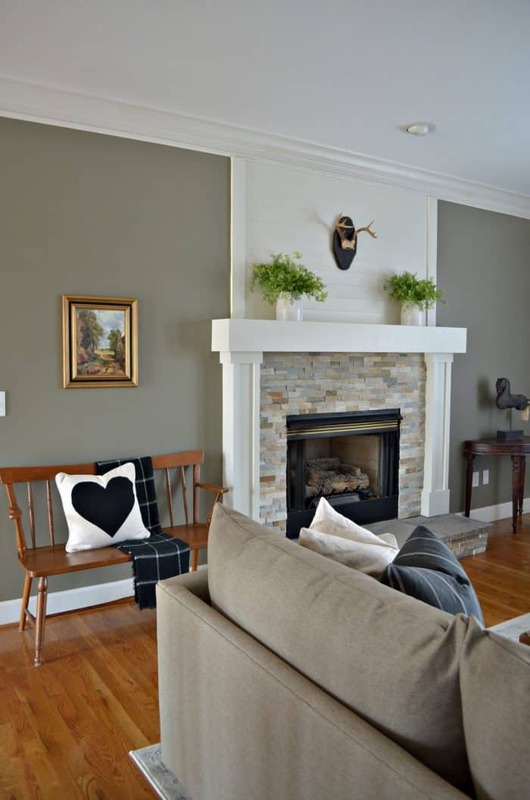 The wall color is Adaptive Shade and mantel is Pearly White, both by Sherwin Williams. To say I am pleased in an understatement. Having the fabrics here in my house allowed me to pick the best paint color. I want to thank Bassett for this partnership. The quality of furniture and service are top notch. 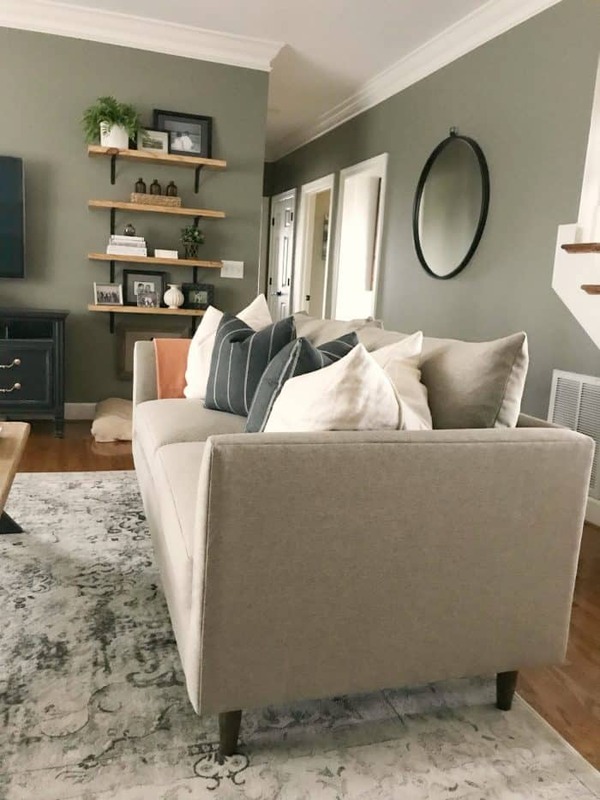 I’m listing all of the new pieces in our living room makeover below. I thought it would be easy to have them all in one place. Just for fun…if you want to see how the room looked before you can see it here. It looks SO GOOD Sonya! I love everything you chose – those pieces are so beautiful! 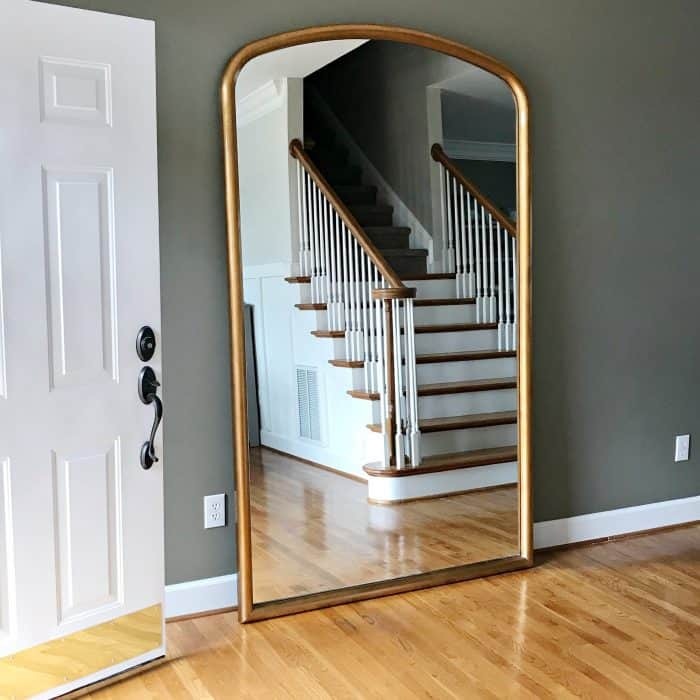 And that mirror makes such a beautiful statement when you go into your home! And the paint color is PERFECT! Yay! Love it all! Thank you friend. I’m so pleased with it all and YES that leaner mirror is fantastic. The paint color makes all of the sampling worth it. This looks so stinkin’ good Sonya! I adore every piece you chose. 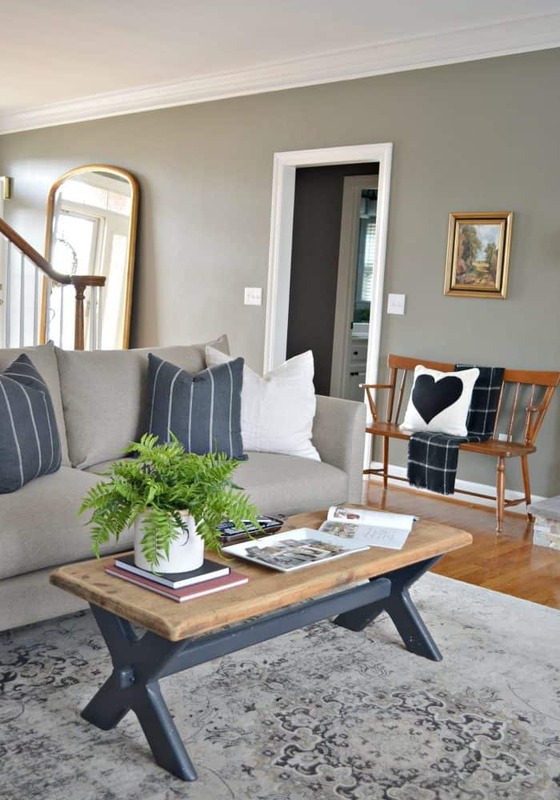 While the sofa & chair are gorgeous, that leaner mirror almost steals the show! It’s crazy how much light mirrors can add to a space. And your new paint color is just perfect. Great job! I died when that mirror was delivered!! It is absolutely stunning. You are right, it makes the entire space. Thanks for your kind words. I know you are on the hunt for a sofa, be sure to check out Bassett. Thanks Jamie! Thrilled with how it all came together. 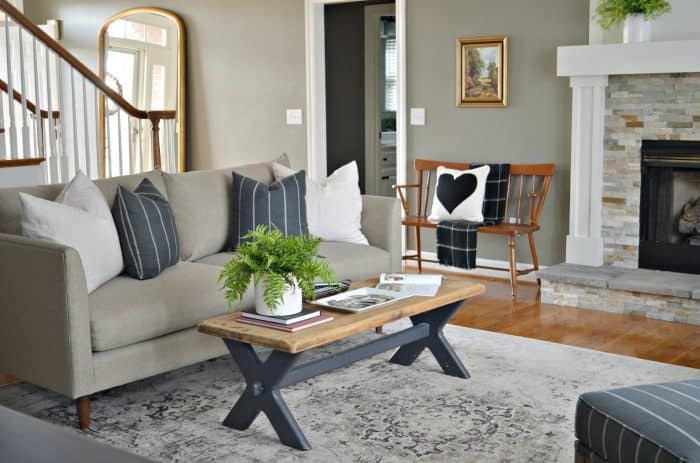 Your living room looks beautiful Sonya! Love the pieces that you chose! Thank you Lisa. I’m really happy with how mixing the modern collection sofa with the chair worked.